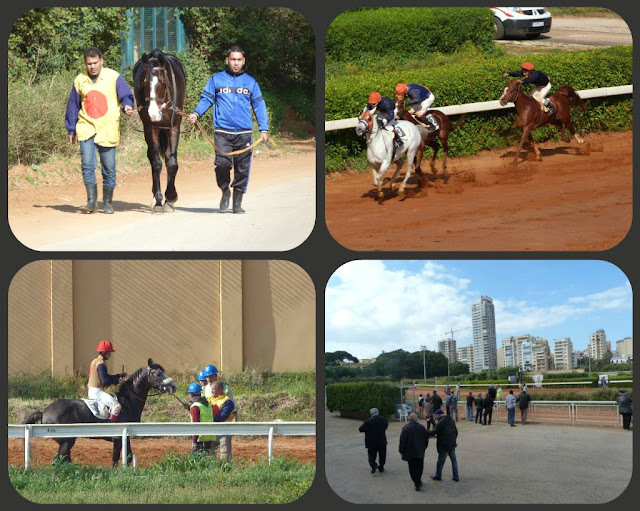 While we were in Beirut we got a rare treat, thanks to one dedicated cab driver, to visit the Beirut Hippodrome (the one with horses, not the Roman ruin.) The Beirut Hippodrome, formally the Hippodrome du park de Beyrouth, as it stands was built in the 1920s and was wildly popular in the 1960s. It is closed to visitors who have not made reservations, but our cab driver negotiated on our behalf, explaining that we were ajnabi, foreign, and that we should be allowed to visit because we were tourists. No doubt, the fact that we had three young women in the group helped secure our entry. There were very few women, just middle-aged and older men, which gave the place a bit of a seedy vibe, but the very few people who spoke to us were friendly with one notable exception. This sign indicates that you cannot have cell phones on at any time during the races because they could be used for cheating during simulcasted races, at least I'm assuming. A friend was almost thrown out by a very grumpy security guard because he couldn't read the sign. The situation was compounded by the fact that my friend was Arab, and the security guard assumed that he could read Arabic and was just lying. So, just remember, no phones.